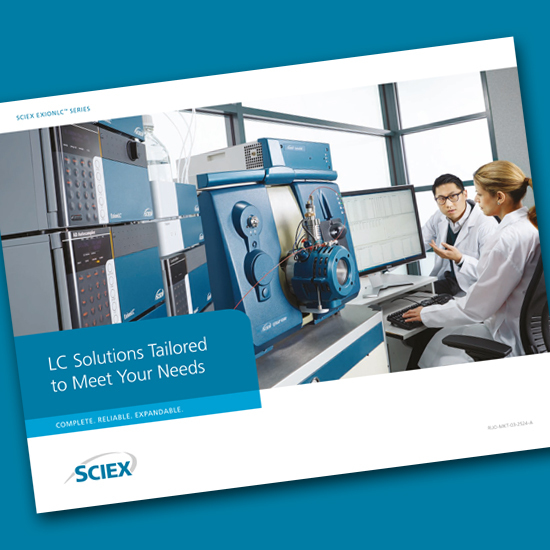 Designed for seamless integration with SCIEX mass spectrometers, ExionLC analytical HPLC and UHPLC systems provide the speed, sensitivity, resolution, and reliability that you need for routine or complex LC-MS analysis. An affordable system that can handle a wide range of applications. With both HPLC and UHPLC capabilities the ExionLC AC is a reliable robust solution for routine analysis. 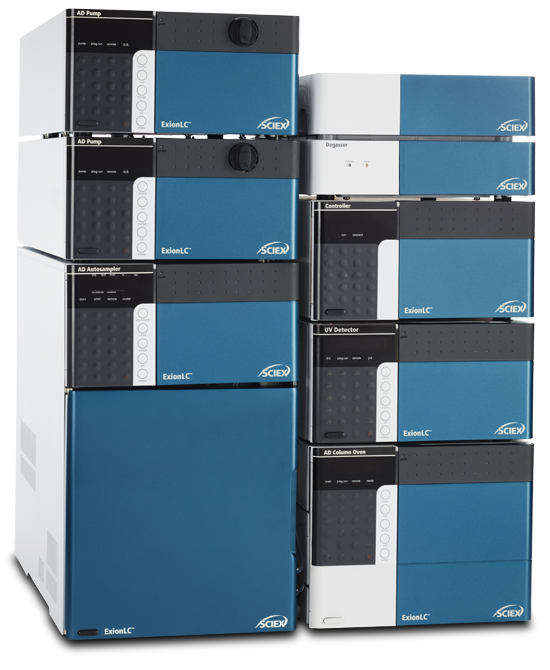 The system combines near zero carryover, full UHPLC capabilities to provide world-class performance under the most demanding analytical conditions. Choice of compact two-column oven, or six-column. Modular components allow you to update your system to keep pace with changing requirements. Add a column switching valve, two additional pumps and do on-line SPE. Add a PAL autosampler for automatic sample dilution or on-line microSPE. Allows you to select between two solvents per channel from up to 3 different pumps. Up to 12 additional cooled sample trays or vial racks to the AC or AD system. Expands capacity with 324 x 1.5 mL vials, or 6 microtiter plates in 96 or 384 formats. Increase productivity by adding a PAL RSI or PAL RTC Autosampler. Time programmable wavelength switching allows detection sensitivity and selectivity. Excellent option for ID, quantitation, and purity analyses at trace levels. Your lab has unique analytical requirements and our goal is to provide LC-MS solutions tailored to meet your needs. The ExionLC™ Series of robust and reliable HPLC/UHPLC systems offers a wide range of performance and flexibility. Make confident decisions faster, resulting in more efficacious, safer therapeutics. Solutions to test and protect our global food and beverage supply. Complete forensic drug testing solutions to help you uphold result integrity. Accelerate the pace of your research to identify key genes, proteins, lipids and metabolites. Backed by over 40 years of trusted LC-MS innovation and service, the ExionLC provides you with the versatility, reproducibility and robustness to tackle the toughest applications, from method development to routine analysis, 24/7. ExionLC AD combines accurate injection volumes with near zero carryover to make quantitation a breeze. Flow rate precision < 0.06% and accuracy of less than 2% gives you the analytical accuracy and precision you need day in and day out. Expand your capabilities with a wide range of options that allow you to simplify method development, automated sample prep or increase throughput. The ExionLC AC delivers with its affordable price and HPLC /UHPLC separation capabilities. Reproducible retention times combined with sensitive, accurate quantitation gives you results you can trust. ExionLC can support multiple components, and configurations to meet the changing demands of your laboratory.